The purpose of this article is to educate affiliates about tokens within CAKE. Section 1: What Are Tokens? Tokens are dynamic placeholders intended to be used in your tracking pixels. Tokens can be replaced with details that have have passed on the CAKE tracking link or information internal to your advertiser's CAKE platform. For example, you may pass a sub ID on the s1= parameter on each unique click. You may want this value passed back on your pixel. Tokens allow for this. Section 2: Where Can I Find The Available Tokens? Section 3: How Do I Implement Tokens? 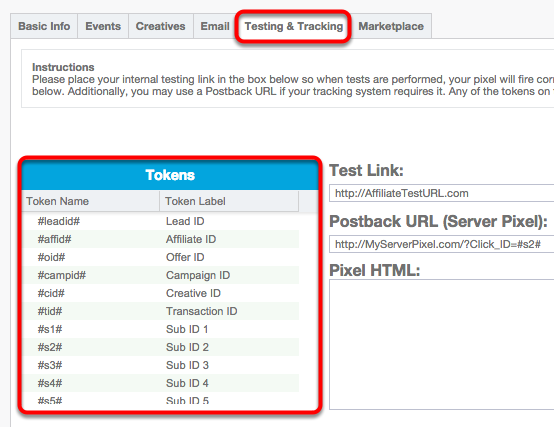 Tokens are intended to be used within your tracking pixels to pass back either static or dynamic values. To use a token, you can either copy/paste the token from the list into your pixel, or you can simply click on the token and it will automatically be placed where the curser is in the pixel. Section 4: What Are Some Basic Token Examples? In the example above, the affiliate has implemented a postback URL. On every click, the affiliate is passing a unique click ID on the s2 parameter of the tracking link. 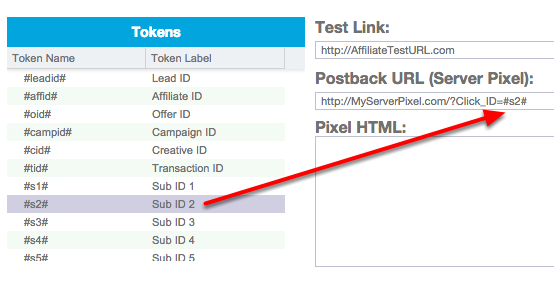 The affiliate requires this value to be passed back in their postback URL in the Click_ID parameter. Therefore, the affiliate has used #s2# to pass this information back dynamically. Additionally, the affiliate wants their payout passed in a revenue parameter because they are doing a revshare campaign with their advertiser. Instead of being paid a static CPA, the affiliate's payout will change per conversion. Therefore, the affiliate has leveraged the #price# token to receive their payout. Lastly, the affiliate would like a unique Conversions/Lead ID passed back to ensure they receive a unique ID from their advertiser's CAKE platform passed into their platform. System Setting - What is the Featured Offer in the Affiliate Portal?